On Friday, March 8th, myself and six other USA based anglers packed our gear and saddled up as we prepared to depart for Bogota, Colombia. With Seth Hartwick leading the group as charter master, we were in for one heck of a trip. With the first leg of the trip complete, we loaded up all of our gear and spent Saturday morning on a 3-hour road trip Southwest full of twists and turns, cliffs and climbs and descents, all so we could reach the Villavicencio airport. Believe me when I say that I truly don’t think most people I know would ever do that drive more than once. 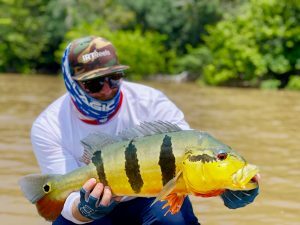 By the time we arrived at the airport, our small group of American anglers had started to acclimate to “Colombia time.” Here, time seems to move a bit slower: a five-minute wait can mean an hour and one hour can mean two. Regardless, the small village was more than welcoming to us seven state-side foreigners and was a true reminder that, sometimes, the “big city mentality” can be too fast paced. It’ll do you good to take things slow now and again. 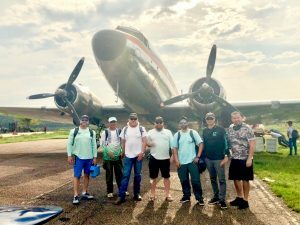 Before long, we found ourselves boarding a 1960s DC3 cargo plane; our fellow passengers ranged from boxes of juvenile chickens to cargo boxes filled with what I estimated to be fishing gear and tackle with a price equal to that of a midsize luxury sedan. After two hours of cramped, cluck-filled flight, we touched down on an airport in a remote El Guaviare riverside village. One of our guides translated the name of this village as “landslide mine town.” The geology and erosion of this area was astonishing. Just like with our rocky road-trip earlier, most will only do that flight once and only if absolutely necessary. With that said, it was an invaluable experience and I cannot wait to do it all again. This airstrip – the same one that on this day welcomed a cargo of restless poultry and foreign fishermen – once saw heavy traffic via the Columbian cocaine trade, sometimes shuttling out as many as 50 planes filled with the stuff. Security was rugged and tight, and the heavy presence of the armed militia was alarming at first, but it didn’t take long during our bag check before we all loosened up. After sharing some laughs on both sides, we spent some time in the local markets searching for some last-minute provisions while some of the locals packed (and I mean PACKED) our panga we would use to get to base camp. After a five hour, up-stream, river boat ride (yeah, you read right… five. hours. ), we finally arrived at camp. There was no time to spare. We ate dinner, prepared our rods and tackle bags, and prepared for the week’s journey with a brief from our guides.